Essayist, novelist, philosopher, and columnist Susan Sontag had a literary career that spanned genres and decades. Though she is principally known as an essayist, she thought of herself as primarily a writer of fiction. She published her first novel, The Benefactor, in 1963, and her final novel, In America, in 1999. 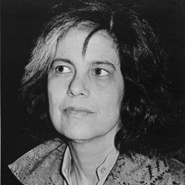 In her essays, Sontag theorized the ethics of art, attitudes toward disease, and various facets of popular culture. Among her most noted works is a collection of essays called On Photography, in which Sontag explored the history and present-day role of photography, with particular interest in what she described as an inherent conflict between properly recording and intervening. A human rights activist, she served as president of the American Center for PEN, the international writers' organization dedicated to freedom of expression and the advancement of literature.